Caring students and staff from Reaseheath College in Nantwich have raised a record £20,380 this year for Macmillan Cancer Support – with more to come. 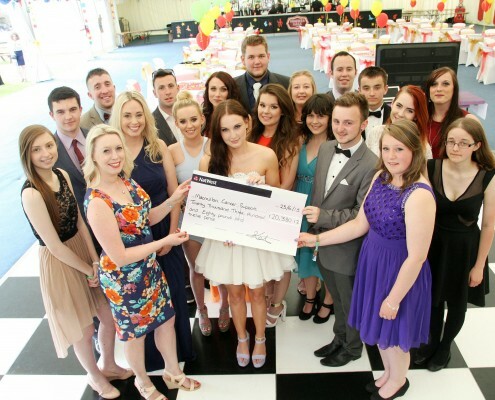 Members of the College’s Student Association presented their bumper cheque to representatives of the cancer charity at the student summer ball last Tuesday. Macmillan fundraisers have been so impressed at the success of the students’ RAG (Raising and Giving) activities that they have asked them to write a RAG Guide advising other colleges and universities who are considering supporting the charity. Fundraising Manager for East Cheshire, Louisa Walmsley, said: “Macmillan Cancer Support is hugely grateful to the students and staff of Reaseheath College for raising such a phenomenal amount of money. Macmillan Cancer Support is one of Britain’s largest charities and provides specialist healthcare, information and funding to people living with cancer. The charity funds a Macmillan Benefits Advisor, based in Nantwich, who helps people to apply for a Macmillan Grant to help meet costs that can arise from the condition and its treatment. In 2013, 281 grants were handed out to residents of Cheshire East, totally £48,486. Reaseheath’s Student Association organised 24 fund raising events in RAG week alone, including a masquerade RAG Ball, a staff versus students football match, a raft race on the college lake, a tractor pull and a Three Peaks Challenge by students and staff from the construction department. The public also had the chance to be a zoo keeper for a day. In addition to fundraising for Macmillan Cancer Support, Reaseheath students and staff raised a further £3,000 for the Poppy Appeal and £1,368.90 for the Epilepsy Society. Further funds remain to be collected and it is hoped that the final total raised this year may reach an impressive £25,000.